I am SO excited to share this Girly Bits Polish made for the September Polish Pickup! Girly Bits Chrysalis is Pam's contribution for the September Polish Pickup theme of Fall Foliage and Fun. Scroll on down for more pictures of this gorgeous polish as well as the inspiration photo which is equally as gorgeous. Girly Bits Chrysalis is what I am going to call a mossy mint green concoction of multichrome flakes, holographic and microglitter. Girly Bits Chrysalis has a clear base packed with a variety of jewel-toned flakes. This is absolutely PERFECT for September, especially the Fall Foliage and Fun theme. I am wearing 3 thin coats plus top coat though I could have gotten away with two. This dries VERY SMOOTH. Like, shockingly smooth. It's the same awesome formula I have come to expect from Girly Bits. 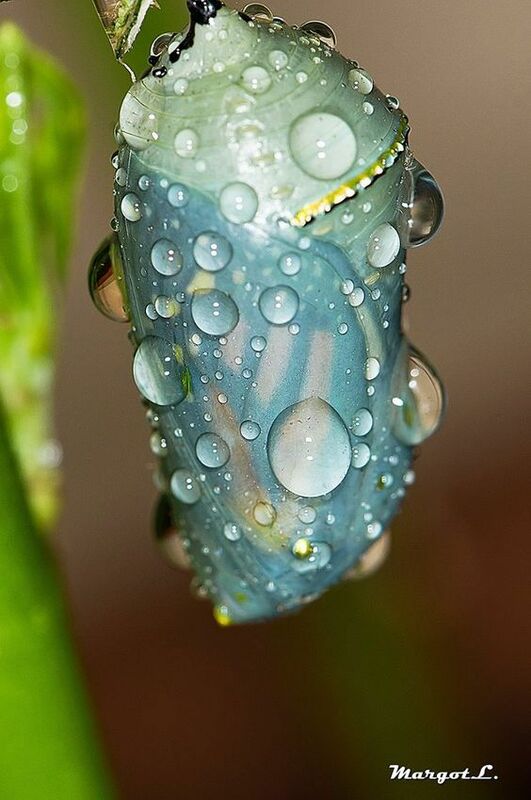 Girly Bits Chrysalis is inspired by a monarch chrysalis. Pam explains: "we live in the migratory path for the monarch butterfly so in the fall they gather by the thousands on the southern shores of Kingsville and Pelee Island. 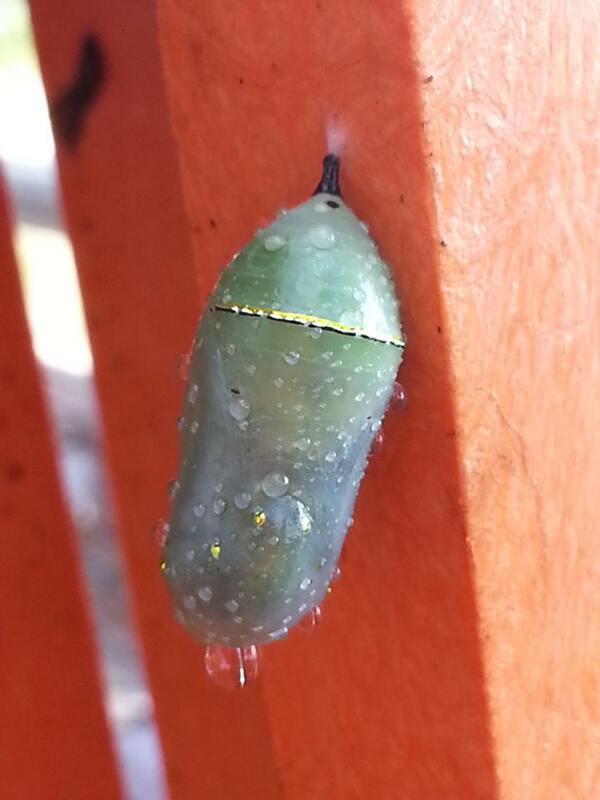 We often find their beautiful chrysalises suspended from milkweed, or branches and outdoor furniture." Pam snapped the second picture of a chrysalis on her deck chair at the cottage on Pelee Island and the first image (below) was found on good old Google! This polish WILL NOT BE AVAILABLE again after the Polish Pickup shop closes for September (details on dates are below). Make sure you mark you calendars for September 1 at 11AM through September 4 at midnight EST. 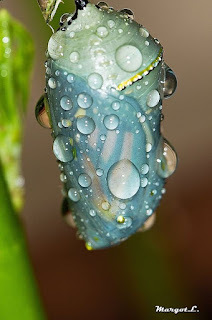 Do not miss Girly Bits Chrysalis - it's so so so gorgeous. Shop is live the first Friday, 11 AM EST (September 1, 2017), of each month and stays open for four days, through the following Monday (September 4, 2017) at Midnight EST. This is the ONLY time frame in which the monthly polishes will be available for purchase. I had to share a bottle shot because this polish is just so pretty I want to stare at it again and again. It could be a green cousin of Girly Bits Grand Prospect Haul, the Polish Con Brooklyn 2017 Exclusive. If you missed that, make sure you grab this! You won't be disappointed. You can purchase Girly Bits Chrysalis from the Polish Pickup here from September 1 to September 4, 2017. Follow Polish Pickup on Instagram and join the Polish Pickup Pack on Facebook to see all the other polishes available this month.